Think of a color tone that reflects your feelings. Mix a color tone by using the color picker. The background of the page will change according to the color tone you pick. This will give you a better sense of the color you have chosen. With the color picker you can mix 16,777,216 color tones by combining three parameters: hue, lightness and saturation. Hue is the basic value of a color tone (something that we usually refer to as 'green', 'blue', 'orange', etc.). You can adjust hue in the vertical scale on the right. 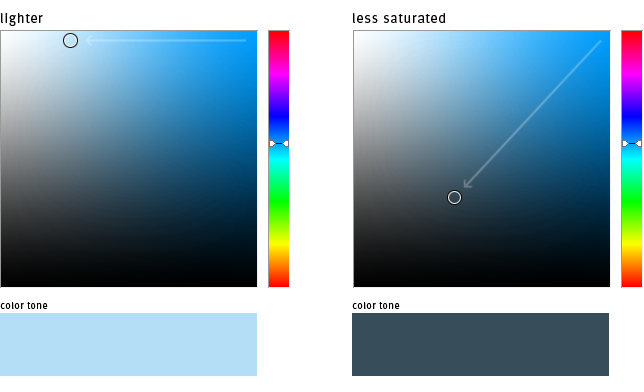 Lightness determines if the basic hue is lighter or darker than it's basic value. Move left it will be lighter, as if you added white to it. Move down and it will be darker, as if you added black to it. Saturation is the purity of the color tone. The color is purest in the upper right hand corner and it loses its purity when we move diagonally to the lower left corner, as if you added gray to it. Tip: Try not to rush. The beauty of it is to slowly mix the appropriate color tone. - message to a follower ("send as message" is checked). The newly posted color will be shown "fullscreen" in the expanded view. - search for the similar color tones posted by other users. 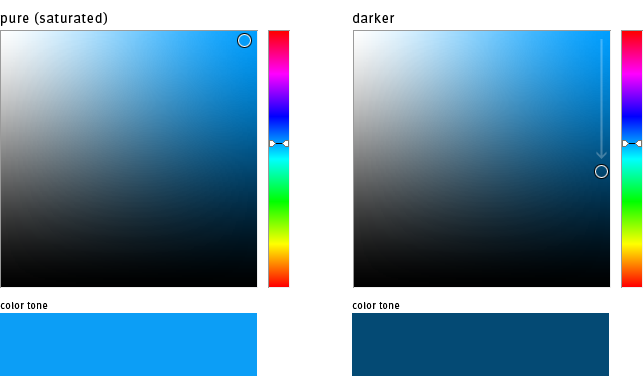 - search for similar colors (type in the hexadecimal code of a color tone). Color search will list approximate matches. Look up your friends and follow them. Their colors will appear in the "My Network" color quilt. You can create art by choosing a composition and filling it in with a color sequence from your own Chromapost diary. Step 1 - Pick a composition: Choose the number of colors you would like to use and then pick a composition from the corresponding group. Step 2 - Choose colors: Pick a start color from your Chromapost diary and then choose whether you want an ascending or descending color sequence. Give it a title (optional). Click ‘Save’ and your unique Chromapost artwork will become visible in the public gallery and your own gallery. (Before you click ‘Save’, you can experiment and play by going back and picking a different composition and color sequence until you are satisfied with the result.). Step 3 - Share: You can download your creation, send it in an email or share it on Facebook, Twitter, Pinterest or Tumblr. All of these sharing options are also available when you click on any published artwork on any gallery page. Place your cursor over any artwork in your gallery that you wish to delete and click the ‘X’ in the upper right hand corner. The deletion is permanent and cannot be undone. You can delete only your own artwork. All of the artwork can be found on the Gallery pages. The Personal Gallery of each Chromapost user is accessible through the user’s Profile page. The Gallery accessible through the main menu contains every user’s creations. The Featured Artworks Gallery is a selection of artworks curated by the Chromapost team. In addition to posting and sharing your emotional footprint Chromapost Social Network is preparing ways for you to apply your colored quilts. The possibilities are endless and you can see some examples on the original Chromapost website.